Salomon inarguably makes some of the most popular trail running shoes on the planet, but for my taste their lasts have tended to offer too much rigidity and/or support. Happily, the Speedcross 3 offers a fresh take. Unlike the high-pronation control of Salomon's XT Wings, the Speedcross is noticeably softer—some might say cushier. Frankly you don't expect a racing shoe to be this comfortable, and if there's going to be any real concern here it would be that maybe the Speedcross is a little too soft—a little mushy, even. In practice, however, the shoe's cushiness never degenerates into sloppiness. The shoe is light and nimble, and it has quickly become one of my favorite trail runners. I wear it just about every day, for just about everything. I even wore it for some unsanctioned load-bearing work en route to skiing Tioga Pass's False White Mountain. 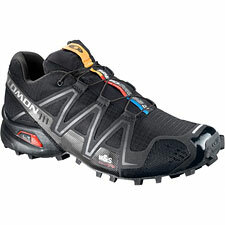 Fans of the basic elements of the XT Wings will find a lot of similarities here, including Salomon's cinch-up lacing. I've never really warmed to this lacing system, although it does let you leave the shoe loosely cinched so that you can wear it like a slipper for street use. For running or hiking you'll obviously want to tighten it up, and for that I recommend folding the lace tab under the laces' criss-cross, to keep the tab from flopping about and presenting a snag hazard. If that remains too new-fangled for you, you can always cut the tab off and tie the shoe's laces in the traditional manner. In addition to the shoe's reduced rigidity and support, it is also lighter than the XT Wings—a measured one pound, six point seven ounces per pair (US 9 1/2). That's not quite so light as Pearl Izumi's excellent Peak XC, but unlike the Peak XC, the Speedcross has a rugged sole that is fully capable when it comes to protecting your feet over rough ground. That absolutely makes the shoe attractive if you like to use your trail runners as crossover hiking shoes (as I do). On the whole, the Speedcross has proven to be a remarkably comfortable and versatile shoe at a nice, light weight. It has a soft but springy feel that makes it a joy to wear for everything from walking around the block on concrete to running hard on trails to scrambling about over talus. Add in the shoe's simple but sharp styling, and this one is a clear winner. Recommended.